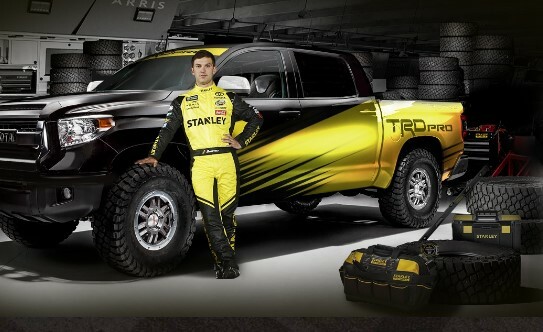 Stanley Tools is giving away a brand new 2018 Tundra, a VIP Racing Experience Vacation with Nascar's Daniel Suárez and a ton of Stanley and Dewalt tools! Grand Prize: One (1) 2018 Model Year Toyota Tundra where the manufacturer’s suggested retail price (“MSRP”) of the Prize Vehicle to be awarded is Fifty Thousand Dollars ($50,000) including any applicable upgrades. A VIP racing experience comprised of a four (4) day, three (3) night trip for two (2) persons to Dallas, TX scheduled for April 6, 2018 through April 9, 2018 (“Trip”). The approximate retail value (“ARV”) of the Trip is $3,500. An assortment of STANLEY tools and DEWALT tools and products. The total ARV of the tools prize pack is $2,043.23.The total ARV/MSRP of the Grand Prize in this Sweepstakes is $63,043.23.